Emma had friends to play with when she was in elementary school, but now she is a tall, redheaded girl who wants “to get the heck outta dodge”. 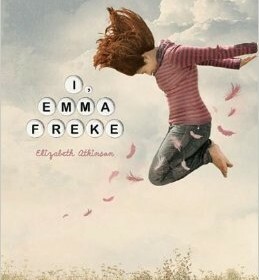 I, Emma Freke by Elizabeth Atkinson is an exceptional book. Have you ever been called weird or different? Emma’s life is exceptionally hard being a tall redhead who is named Emma Freke. If you say Emma Freke slowly it says “ I’m a freak”. Emma lives with her mother, who makes her call her Donatella, her “Nonno,¨ Nonno’s dog, Eggplant, and her neighbor and best friend Penelope who is 10 years old. Life can be so hard if you haven’t found yourself yet, especially when you have questions. Emma is frantically searching for answers to the two main questions; “Why is my hair so red when my mother is Italian? Why don’t I know my father?” When Emma finds the answers will she be okay? I learned bitterly that everyone is different. My friends and I used to play with Barbie dolls and I remember wanting to look like a Barbie. Emma is trying to act like the characteristics of a Barbie doll. She is trying to change her name like Barbie and she is forgetting that everyone has little pet peeves but we don’t let them control our lives. I thought the book was very well written and was very interesting. It reminded me of my big family and how crazy people can be. I loved the interesting characters and how in the end Emma thought she knew where she belonged, but then she realized she was in the exact same place she was supposed to be in. I would recommend this nonfictional novel for everyone from the ages 9-13 years old. I, Emma Freke, in my opinion, was excellent.